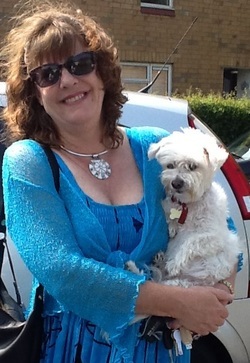 Hi, I'm Julie Umpleby and welcome to Diamond Light World! For almost 2 decades, I have been dedicated to exploring the gifts the diamond brings us and and how it relates to our spiritual development as human beings. My teacher has been the diamond itself, as each step of the way I have been guided by Higher Self into experiencing both the depths and incredible expansiveness of all that it offers us. My learnings and subsequent sharings have been translated into all of the information, products and energy processes you find on this website. Like so many who find themselves on the spiritual journey, or The Path as it is often called, mine also began with an exit from a successful corporate career. Having a BSc degree in Botany and Zoology, I somehow found myself entrenched in the world of petrochemicals and oil derivatives where I spent a mostly fabulous 19 years. I enjoyed my job, my work colleagues and all that I learned in that environment. I was gifted with many opprtunities for personal and professional development and advanced from laboratory and research work into sales, product and customer service management which I loved. In 1997 that all changed as our company faced a take-over by the big multinational Dow Chemicals and deep inside me I knew I did not want to be a part of this new form the company would be taking. As my inner sense that this wasn't right became stronger, I also found that something else was stirring within me. The smorgasboard of Life itself had always been a mystery to me, and there was a deep knowing that there was more than what we are taught formally. In 1997, that mystery began to infringe on my life with strange happenings, impulses and physical reactions to people and things like crystals.I found that if somebody came within 6 feet of me physically, every hair on my body would stand on end. This effect was difficult for me to explain to people at the time - especially as I was living in South Africa which has a glorious sunny, warm climate. Work colleagues would notice the goose bumps on my arms and often ask me if I was cold! I didn't realise at the time that my nervous system was already being ramped up and that I was experiencing many of the initial 'pre-explosion' kundalini effects. I became super sensitive to many things - emotions, people, environments, noise and rocks. My very first crystal was a rose quartz I had purchased from a geologist who knew nothing about the more esoteric properties. I just knew I had to have this pink stone that I couldn't put down, and that initiated an unusual heat in my hands whenever I picked it up. It also soothed my frazzled emotions at the time in a way that I couldn't explain. Thus began my foray into the often extremely mysterious world of energy healing and an intense desire to want to know and understand more of what these ever increasing strange phenomena were about. I wanted to know what was happening to me, what this strange 'energy' was that I began hearing people speak of, what my soul was, what real purpose did it serve, and the ubiquitous, all consuming question of Why am I here? Almost from the beginning, I found that I would be gifted with a mystical type of experience and then synchronistically be guided in a direction that would enable me to learn the meaning in it. I started with Reiki following a fascinating bodily reaction to a past life regression that happened to be with a Reiki Master. Fae Tucker, a healer and seeker for 30 years, became my Reiki teacher and my first spiritual mentor. She provided me with a powerful foundation and many basic principles to always be aware of. To this day, her words often echo as I find myself understanding the wisdom at ever deeper levels. Between 1998 - 2000, I studied and qualified in Reiki , Colour Therapy, Antaneea Soul Integration Bodywork, PNI (Psychoneuroimmunology), Spiritual Healing, Natural healing. I became a therapist and a teacher. I learned about my personal soul drive through the Michael Teachings and discovered my archetypal essence to be that of an Inspirer, a shaman-priest. I attended many workshops to further my personal and spiritual growth and discovered myself as the wounded healer. My personal healing journey became an integral part of my gift to others. The profound information about the Diamond Light Grid began with a series of messages and mystical 'diamond' experiences from the essence that I now call Big Jules - my Higher Self, she who sees more than I can. These started in 2003, a year after I followed yet another deep impulse and relocated from South Africa to the UK. The initial introduction was through the Diamond Light Codes that both fascinated, inspired and intrigued me. Almost 18 months after this first gift was given, I was (very unceremoniously) presented with a 6 foot, brilliant diamond grid of light at 2.30 am one cold English morning. With instructions to 'build the grid between the stars', I embarked on what would become an epic journey into the mysteries of the soul as taught and understood through the lens of the diamond. Over the ensuing years I would be guided through powerful and spontaneous kundalini experiences, introduced to the many facets of the diamond, be given teachings and reclaim my soul itself through deeper energy work and profound ancestral, personal, and collective healing. My understanding and knowing strengthened and expanded with each new experience as I listened, questioned and learned. I now recognise the years since then as a lengthy initiation into the mystery school of life, guided by the diamond itself. Intensely challenging at times in the way of most initiatory experiences, this protracted rite of passage brought me to my knees on many occasions. Each difficulty brought me face to face with my own beingness, my ego and its fears, my own humanity, and ultimately my soul. In my surrender to Great Spirit another facet of the diamond would light up, another gift of understanding and knowing would be revealed. I was told at one point by Spirit that it would take up to 20 years to fully understand the diamond and at just over the halfway mark, I can now fully appreciate that statement! I am deeply committed to bringing you as much insight and understanding as possible to assist you in moving forward on your spiritual journey, using the essence of your own diamond as a key to your progression. Even while my own journey has been coloured with many amazing experiences and teachers, the ultimate understanding comes from our own source connection and from going within. This is the purpose of the diamond - to reconnect you with the very heart of your essence, and to allow that to be your navigator. Your diamond is the heart, the love, the joy, courage, wisdom and deeper knowing of your own Soul. Flowing through the grand, universal diamond grid is the Sacred wisdom of the ages, the truths of the universe, ever unfolding and creating. These living transmissions of light have been upgraded to broadcast the new cosmic, diamond light energies from 'Beyond the Beyond' into your energy field and home. They serve as activators of your diamond light body, and are also awakening an audial Light Language in those who are ready to be activated. Use the Light Codes for personal guidance, support with clients and supporting energetic shifts aligned with your Diamond Light Body. Includes pdf booklet with summary description for each code and guidelines for use.